The bamboo plywood will received the Uniform pressure, then get over the cracking problem. 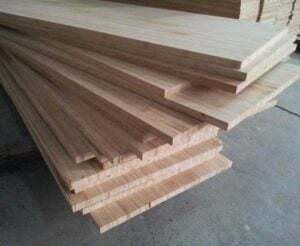 Take the bamboo plywood into high pressure vessel, under the two or three atmospheres, The temperature is 80~90°C for 4~6 h, then reduce the pressure in slow. next, take out it to dry. Its also take the Pharmacy into high pressure container to anti-mite and high frequency electric field anti-mildew treatment. Use the cut new bamboo Place Between parallel plate electrodes, meanwhile add the High frequency electric fiel. At the moment, the bamboo plywood is heated by high frequency electric fiel. Because induction heating generates heat, its make the bamboo plywood’s cytoplasm and the liquid cell are destroyed by heat. At the same time, the cell membrane tightens and compresses the interstitial space. Its becomes very dense. Because of the changes in its composition. All the fibers in bamboo plywood have become the dense. On this Basis, the bamboo material is further coated with polyurethane resin paint, which has certain anti-cracking effect.